Jig-A-Loo is unlike any other lubricant - it contains no oil, grease, wax, petroleum distillates or detergent; it is colorless and won’t stain. 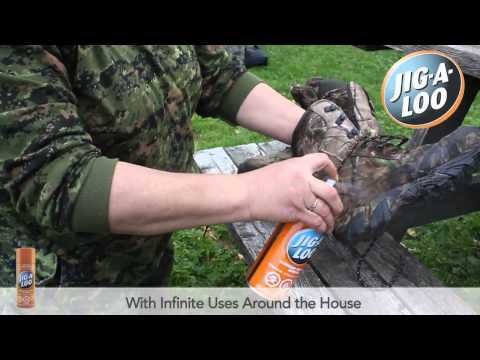 It stops squeaks, un-sticks just about anything, protects against rust and is an exceptional water repellent and more. Jig-A-Loo is ideal for wood, metal, glass, rubber, leather, fabrics, most plastics and a number of other surfaces. Helping just about anything operate and slide better with its thousands of uses, it's the can of all trades™. Vapor may be harmful & flammable. Irritates eyes, skin and respiratory tract. Contact with flame or hot surfaces may cause toxic gases. Avoid contact with eyes, skin and clothing. Keep away form heat, sparks and flame. Do not smoke. Use only with adequate ventilation. Do not breathe vapors, spray mist, or over spray. Ensure fresh air entry during application and drying. If you experience eye watering, headaches or dizziness or if air monitoring demonstrates vapor levels are above applicable limits, wear an appropriate, properly fitted respirator (niosh approved) during and after application. Follow respirator manufacturer’s directions for respirator use. Wash thoroughly after handling. Do not puncture or incinerate container or store at temperature over 50°c. Container may explode if heated. Eyes: immediately flush the contaminated eye(s) with lukewarm, gently flowing water for 15-20 minutes, while holding the eyelid(s) open. If a contact lens is present, do not delay flushing or attempt to remove the lens. If irritation or pain persists, see a doctor. Skin: take off contaminated clothing, shoes and leather goods (e.g. watchbands, belts). Immediately flush with lukewarm, gently flowing water for 15-20 minutes. Call a poison centre or doctor. Double bag, seal, label and leave contaminated clothing, shoes and leather goods at the scene for safe disposal. Inhalation: if affected by inhalation of vapour or spray mist, remove to fresh air. Ingestion: have victim rinse mouth with water. Immediately call a poison centre or doctor. Contains (cas no. ): methylene chloride (75-09-2), perchloroethylene (127-18-4), isobutane (75-28-5) and propane (74-98-6).